Nestled on 125 acres of pristine tropical acres along the Gulf of Mexico, the newly renovated Naples Beach Hotel & Golf Club is one of the premier resorts in Southwest Florida and, as the only beachfront resort in the region with on-site golf courses, is an outstanding option for anyone planning on jetting off to explore the golfing riches of the Sunshine State. The Golf Club boasts a superb 18 holes course that has been constantly revamped and renovated over the years to ensure it keeps up with modern trends and standards. Most recently the resort refurbished the greens and tees in 2010 and completed a refurbishment of the fairways during the summer of 2011. 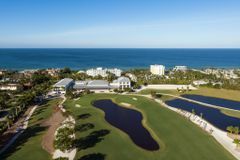 Featuring white sandy bunkers, palm tree lined fairways and expansive water hazards, this is every bit the quintessential Floridian test of golf where a combination of accuracy, course management and power are key to a good score. A large practice putting green and a driving allow guests to work on their game either on days away from the course or to limber up before tackling the main attraction. The Naples Beach Hotel & Golf Club boasts 317 newly renovated guestrooms which exude casual Floridian charm, not mention being equipped with comfortable furnishings and a bevy of modern conveniences and comforts, all designed to maximise your comfort throughout your stay. En suite bathrooms have also been completely remodelled and enlarged, with new showers, vanities and fixtures added. Lavish suites are also available for those looking for an added slice of luxury and space. Each of these is spacious and comfortable with a separate living room, dining area and kitchenette. The package is completed with views over the resort and out towards the Gulf of Mexico from your private patio or balcony. Dining options at the resort are extensive with a number of restaurants, grills and bars serving award winning food that is sure to suit all tastes. For your daily breakfast head to the Everglades Dining Room, and for a spot of al fresco dinging during the day the Poolside and Sunset Beach Bar and Grill are ideal and for dinner, you can’t beat the signature HB’s On the Gulf Restaurant. A visit to this Florida beach resort wouldn’t be complete without making use of the on-site spa. Here you can experience the pleasures of personal well being through the administration of a great range of spa packages and services, administered by trained therapists. From the most amazing massages in Naples to advanced hydrotherapy, soothing skin treatments to age-defying facials, waxing to bronzing; there is something to suit all tastes and for those who just want to wash away the stresses and strains of everyday life, the spa facilities which include sauna, steam room and whirlpool are simply ideal. The Spa also includes a full-service Naples salon for professional beauty services, including haircuts and styling, manicures and pedicures, make-up application and makeovers.